Hello! We hope that this post finds you well and you all have recovered from the holiday season. We are here to let you know that we have opened registration for one of our most popular events the Syracuse Pro Experience to be held on April 15th, 2017 at 3:30 PM. We are back at it again this year at the War Memorial Arena in Syracuse, NY. 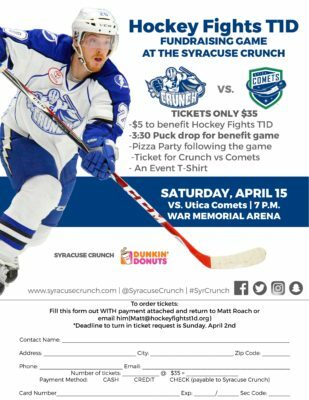 This years event will include a game at the War Memorial, post game pizza party, a ticket to the Comets vs Crunch game and a commemorative t-shirt for all players. If you want to order a Premium Custom jersey for the event you can do so by clicking the jersey images below. The cut off date for jersey orders will be Friday February 17th at 11pm. More information on this event can be found at http://hockeyfightst1d.org/war-memorial-arena/ and https://www.facebook.com/events/582135605303635/.